CGP Europe designs and manufactures high quality, innovative tooling materials used in the thermoforming industry. 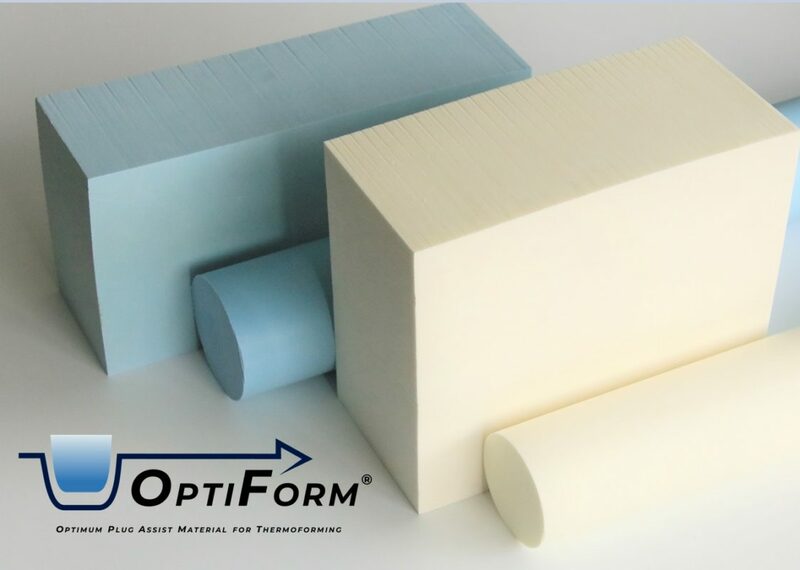 OptiForm® is the plug assist family materials developed by CGP Europe to combine the toughness of engineering thermoplastics with the low thermal conductivity of a syntactic foam. OptiForm® Plug assists will resist the chips and dings associated with production abuse while reducing mark-off and sticking of difficult to process polymers. OptiForm® Materials maintains the high thermal stability required to process today’s thermoformed polymers. 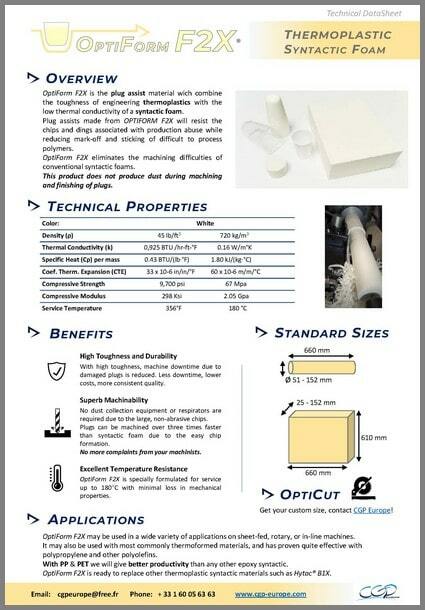 In addition, OptiForm® Materials eliminates the machining difficulties of conventional syntactic foams. The range of product that does not produce dust during machining and finishing of plugs ! OPTIFORM® may be used in a wide variety of applications on sheet-fed, rotary, or in-line machines. 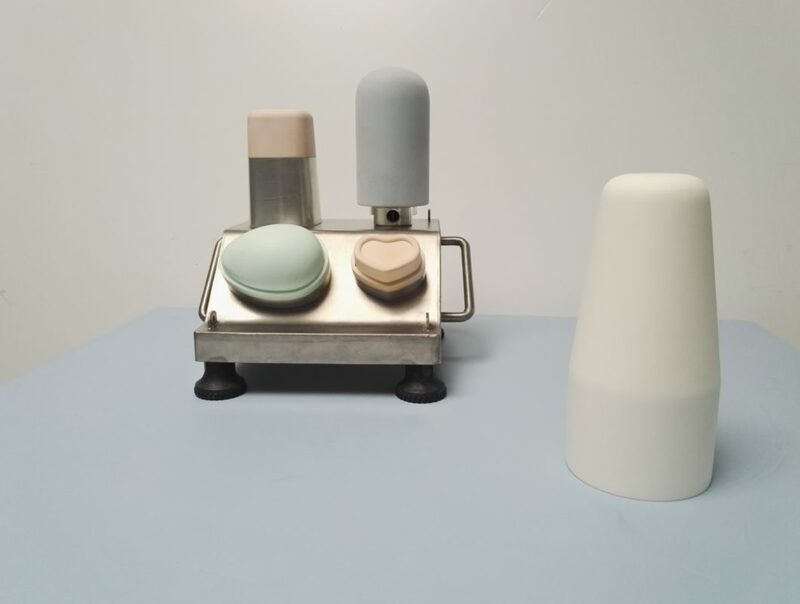 It may also be used with most commonly thermoformed materials, and has proven quite effective with polypropylene and other polyolefins. 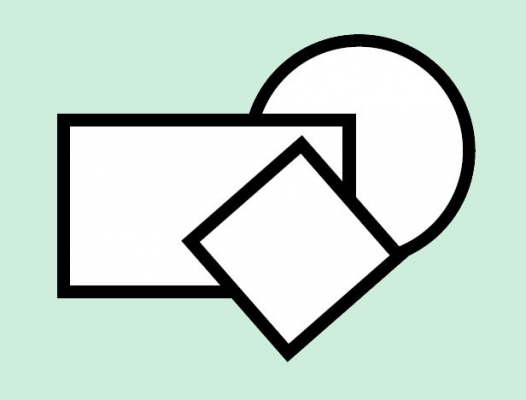 With PP & PET we will give better productivity than any other epoxy syntactic. 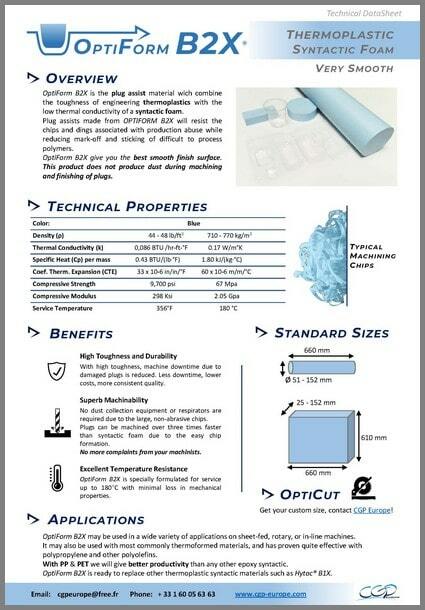 OPTIFORM® is specially formulated for service up to 180°C with minimal loss in mechanical properties. Our products are designed to remove dust from toolmaker workshops. By eliminating dust, we eliminate human risks: no breathing of dust by your teams, no dust on the skin for your operators during machining and finishing of plugs. We improve the comfort of your operators because they no longer need to wear respirators, gloves and long sleeves against dust. No extractor and / or air treatment is necessary. With optiform you will have no worries with safety and health at work. You keep your teams in optimal form! WHAT IS PLUG ASSIST ? Plug assist is used to pre-stretch the heated plastic sheet inside the mold cavity before turning on vacuum during the thermoforming process. The pre-stretching aims at improving the thickness distribution and lots of other parameters (cycle time, mark-off, part clarity, starting gauge…). Plugs have a geometry usually from 10 to 30% smaller than the mold cavity. They have to be made with low thermal conductivity materials such as syntactic foam otherwise they have to be heated. B2X is the plug assist material to combine the toughness of engineering thermoplastics with the low thermal conductivity of a syntactic foam. Plug assists made from B2X will resist the chips and dings associated with production abuse while reducing mark-off and sticking of difficult to process polymers. B2X maintains the high thermal stability required to process today’s thermoformed polymers. In addition, B2X eliminates the machining difficulties of conventional syntactic foams. This product does not produce dust during machining and finishing of plugs. F2X is the plug assist material to combine the toughness of engineering thermoplastics with the low thermal conductivity of a syntactic foam. Plug assists made from F2X will resist the chips and dings associated with production abuse while reducing mark-off and sticking of difficult to process polymers. F2X maintains the high thermal stability required to process today’s thermoformed polymers. In addition, F2X eliminates the machining difficulties of conventional syntactic foams. This product does not produce dust during machining and finishing of plugs.